Jose's Art Journal: David Milne, great or awful? David Milne, great or awful? 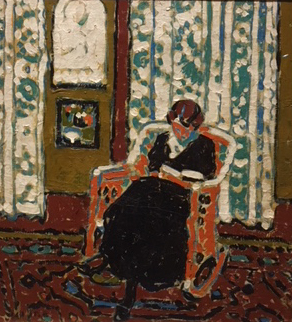 Fresh from the walls of the Dulwich Gallery in London comes the David Milne show to the Vancouver Art Gallery. David Milne is a somewhat unusual artist. He was born in Ontario, Canada from a family of Scottish immigrants and he died in Ontario but, in between, he set out to discover the world art currents of his day and worked restlessly at creating his own style. He developed a very recognizable style of work like many of his contemporaries, some of which have been shown at the Dulwich recently: Emily Carr and Eric Ravilious come to mind. David Milne started with a bang, he did really well in school and when his calling towards art struck he left for New York where he studied at the Arts League and absorbed every current that passed through the galleries in the vibrant pre-war Manhattan. From the Impressionists to Matisse he took it all in and soon created a distinct look and was exhibiting with some frequency. His early style is very characteristic, it almost has a paint-by-numbers feel: A great emphasis on flat colors and simple shapes, a prevalence of thick white impasto and a very sparse use of materials. It contains he ingredients for the rest of his career and, from this point onwards, the prevalence of one element like composition or color or sparseness will depend on circumstances without deviating too much. He supported himself as a commercial artist but he is quoted often as saying that "There is a greater difference between an artist and a commercial artists than between a bishop and a burglar." Clearly he had not met enough bishops or burglars but, be it is at it may, he soon tired of his day job and the Manhattan stress where he failed to secure enough sales of his paintings to make a living. Oh, he also married a poor woman, Patsy, that he dragged through his existence until they finally broke it off. He moved North to live in a more secluded area with his wife and dedicate himself to his art without so many monetary constraints as the big city demanded. He lived very frugally in Boston Corners. When money ran out he would work managing a tea house and becoming a handyman, he even built his own teahouse but sold it quickly eager to get painting. This he did to the dismay of his wife, straining an already difficult relationship. His paintings start to become almost like camouflage tarps. It's hard to see the figures and the tonal values are achieved more by a gathering of color cells than by any gradation or color harmony. His use of material is always sparse. He said his Scottish roots pushed him to make 'a lot with very little' or some such nonsense. Line and composition are the dominant elements here with everything else practically reduced to three notes: white, black and local color. At this point in the exhibition I started to ponder why he would persist in this distinctly shattered and dry style. I always have to second-guess myself when I see artists who despite all evidence against them - keep in mind Milne was unknown and poor at this time with no prospects of ever 'making it' and destroying his marriage in the process - hammer at it with such stubbornness. It is hard to fake such stubborn pursuit but does it really accomplish great art, this dogged repetition? Milne never saw combat as he was stationed in Quebec chasing down deserters. By the time he was sent abroad the war was over. He found out about the Canadian War Memorials Fund that commissioned artists to depict the devastation of WWI and was soon painting said desolation. At this point my frustration with this artist reaches a high pitch. The paintings, drawings in watercolor drybrush really, are very flat and sparse and almost decorative no matter how many times the curators try to elicit the idea that precisely such sparse emptiness is the most fitting commentary on the massacre of Vimy Ridge or Paschendale. I don't buy it. Milne got a big boost from his war time painting and his work was shown with good reviews at the Royal Academy. He thought he was ready to break into the Canadian market but upon arriving in Toronto he found out otherwise. Despondent and frustrated he retreated back to his cabins in the woods and kept painting. His marriage finally collapses after several separations. During this time he focuses on his usual themes of woods and mud and reflections and boulders as well as nympheas, water lilies. These are a million miles away from Monet's evanescent blooms, Milne's flowers are muddy fossils in comparison. His art now reaches its most accomplished state if we understand by accomplishment whatever Milne had in mind, not what an unaware museum visitor would consider beautiful, interesting or even shocking. The artist that most often comes to mind at this point is Morandi of all people. Like Milne, Morandi was obsessive about his still lives as if trying to extract the soul of objects through sheer economy of means. * Lines and composition dominate, Even foliage or reflections and foam or weather become level with the rest of the solid features of the landscape or still life by virtue of allowing no hierarchy of importance. Even his sketches are composed of ghostly lines. * Color is reduced to notes of black, white "filler" and some local color that remains somewhat arbitrary as on a desiccated body. There is no allowance or very little for atmosphere or gradations. *Paint handling is so direct and economic, the canvas texture tends to dominate end the canvas itself is a big portion of the coloring as it is see through. *The theme is always the same, rocks, mud, trunks, water and snow. He rarely lifts his eyes from the ground. His still lives are also very monotematic, variations of very few subjects. Even things that would scream for wild coloring like maple saplings or mine shafts inundated with leeching chemicals get pummeled in muddy browns. *Someone has pointed out already that the photos he took to help his work are more expressive than the paintings. It s true. I am not sure if Milne ever articulated the reasons for this muddy landscapes. Many artist have had a go at textures and earthy feel with a lot more success in my opinion. There is no environmental or higher message here that we know of so we are left to guess or move on. Milne finally got some recognition from Canadian art deities in his mid fifties. He became highly collected by patrons Vincent and Alice Massey which bought 300 paintings in one sitting at 5$ a piece which in the 30's it wasn't as bad as it sounds even if it was a bargain hunt. His subject matter became more whimsical and poetic even when the size of his canvases diminished. These were actually my favorite paintings. Sometimes composed of only three colors but quite poetic. Milne married again, had a son and quite a bit of success in his later years so it all paid off somehow. That somehow is still a mystery to me but it opens so many questions about persistence, those who never made it and the importance of good patrons/dealers when one is a bit hopeless. Here is a video from the Dulwich gallery. In any case, if you hated Milne as some people are bound to do, you can always head upstairs to see the exhibition on "Cabin Fever" a review of our log cabin architectural and life style fantasy through the last century and ours.